John Lewis York has today announced the donations made to the first community groups it has supported over the first three months since opening as part of its charitable giving scheme, Community Matters. Every three months, Community Matters enables John Lewis York to split £3,000 between three local organisations that support important local causes. The Community Matters scheme allows John Lewis York customers to decide which charity they would like to support by voting in store with a token. At the end of each round of voting, John Lewis splits a £3,000 donation according to the proportion of the customer vote they received. The first three local organisations to receive support from John Lewis York were Arc Light, Independent Domestic Abuse Services and Accessible Arts and Media. The voting launched on the shop’s opening day and has seen lots of customers taking part in the voting process. The donations have now been calculated and the charities will be receiving their cheques shortly. 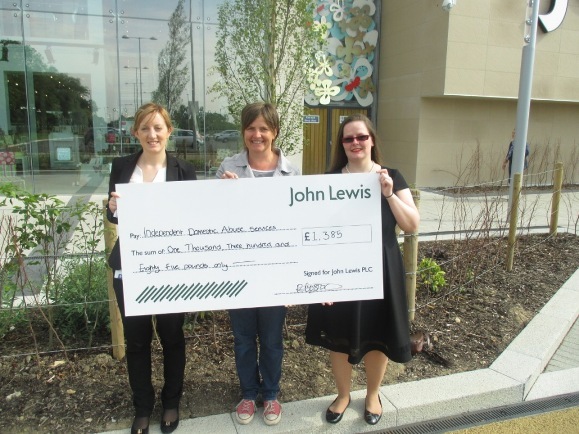 Independent Domestic Abuse Services gained the majority of the vote and received a donation from John Lewis of £1,385. They will use the money to support children and young people who have lived with abuse. Arc Light received a donation of £868. John Lewis’s support will help them fund their active learning programme. Accessible Arts and Media will use John Lewis’s donation of £747 to continue their work to connect people with disabilities and young people across York & North Yorkshire. “John Lewis York is delighted to have been able to support these three charities and the extraordinary contribution they make to the local community. “Customers response to the launch of our Community Matters scheme in York has been fantastic; we have seen a high number of applications and nominations for the next set of charities. The Community Matters scheme is part of John Lewis’s ongoing commitment to supporting the communities in which it trades. John Lewis aims to engage customers, Partners and suppliers to make a lasting change within the communities where we operate. The next three community groups have been selected; York Mind, York Food Bank and Youth Base a Barnardo’s project based in Knaresborough will be supported for three months and in October, another three will be selected. Organisations who would like to be considered as part of Community Matters should visit John Lewis York to pick up a nomination form from the Community Matters collection box in the front entrance.